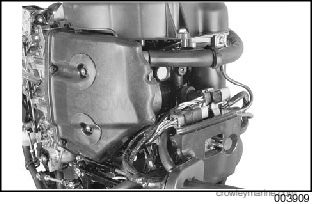 This kit is designed for use on 2004 (SR) and newer Johnson® 25 and 30 HP (597cc) 4 Stroke outboards. DO NOT install on any other models. 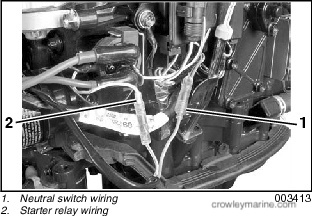 Disconnect battery cables from outboard. Make sure the engine is sufficiently cooled. 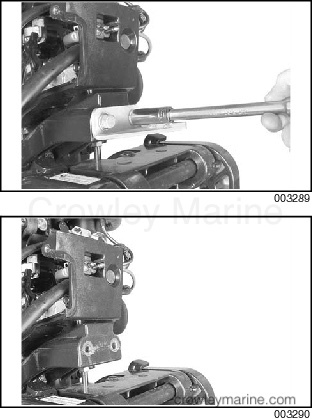 Remove the parts in the following procedures prior to installing the Tiller Conversion Kit. 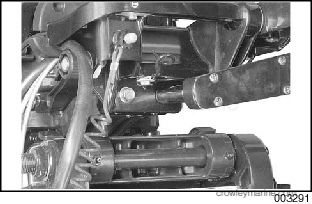 Remove the upper motor cover and both lower motor covers. 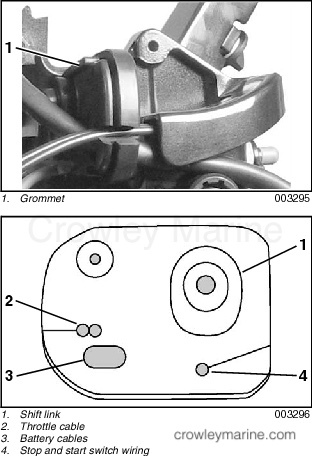 Remove lower motor cover grommet. 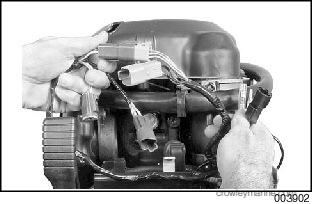 Remove wire harness connectors from holder. 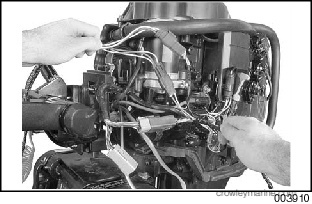 Disconnect the remote control wire harness connectors from engine wire harness connectors. 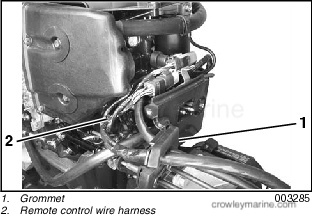 Remove remote control harness from outboard. Position the shift linkage in REVERSE position. Turn propeller shaft while engine is being shifted. 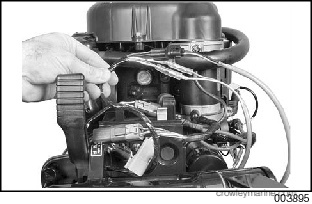 Remove throttle and shift cable retaining clips and washers. Remove retaining screw and plate from control cable anchor bracket. Remove throttle and shift cables. Remove the two retaining screws and control cable anchor bracket. Reinstall front screw and tighten securely. 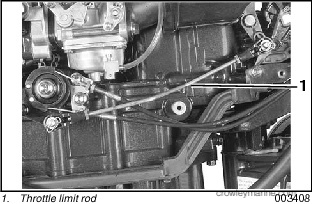 Remove clips and washers at both ends of throttle link rod. 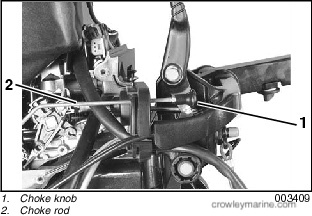 Remove rod from throttle drum and throttle lever. 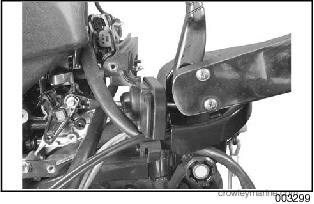 Remove screw and washer, throttle lever and shift lever. 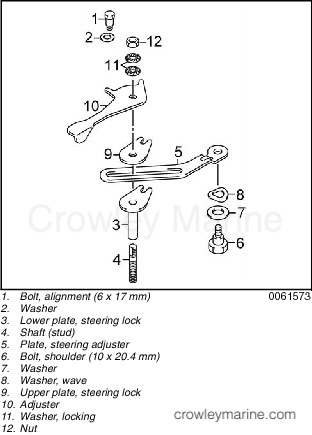 Remove steering bracket screws and washers and remove steering bracket. 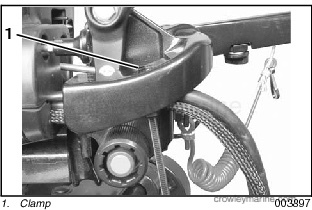 The steering friction provided with this kit is suited for installation on 2004 models. 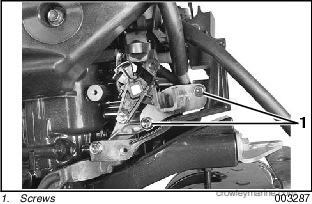 If this kit is installed on older models the steering friction components will not fit. 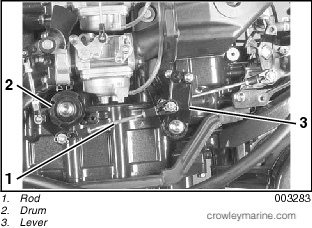 Failure to provide steering friction could lead to improper operation of outboard and result in a loss of steering control. 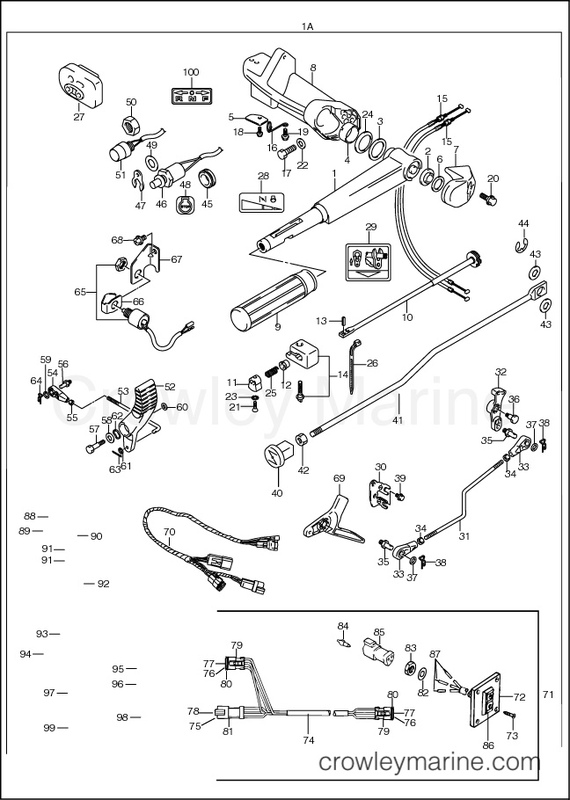 Assemble steering friction parts as follows. Insert lower plate into swivel bracket. Align washer and then plate with alignment bolt hole in bracket. Apply Nut Lock™ to threads of bolt and install bolt. Notch in lower plate must be positioned to move on shoulder of bolt. Torque bolt to 60 in. lbs. (6 Nm). Thread shaft into lower plate. 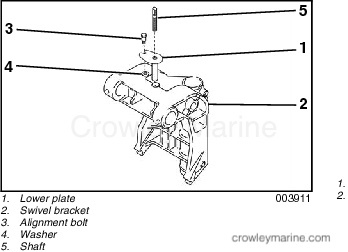 Position steering adjuster plate on shaft. 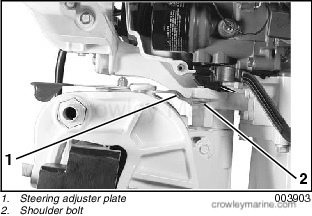 Fasten steering adjuster plate to steering bracket using shoulder bolt, washer, and wave washer. Wave washer must be positioned next to plate. Torque to 20 ft. lbs. (27 Nm). Align upper plate with alignment bolt and position on shaft. Next align adjuster with alignment bolt and position on shaft. Install two interlocking washers with “ramped” sides facing each other and install nut. Tighten lock nut and test steering friction control. 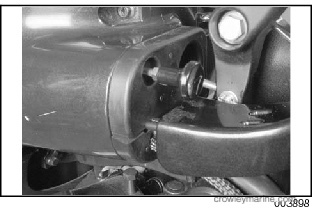 Adjust shaft height to control tension on adjuster. Approximately two full threads must be visible above lock nut when tightened. Assemble actuator bracket, neutral switch and nut onto neutral switch bracket. 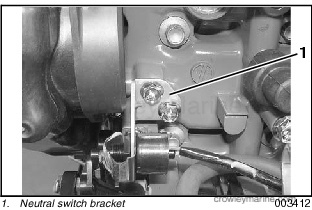 Fasten neutral switch bracket to front of crankcase with screws provided. Torque screws to 90 in. lbs. (10 Nm). Connect neutral switch wiring in series with starter relay wiring (yellow/green). 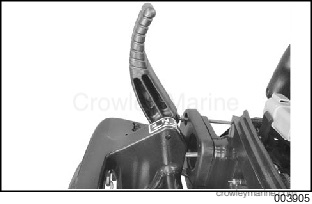 Install tiller handle assembly to steering bracket using screws and washers provided and torque to 37 ft. lbs. (50 Nm). 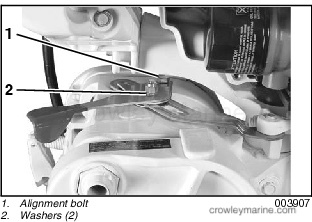 Degrease the new anchor pin and apply Three Bond 1738 adhesive or equivalent to threads. Install pin in top position of notch plate. Torque to 16 in. lbs. (1.75 Nm). Remove and discard lower pin. Install locking nut and connector on threaded end of shift link and adjust length of link to 5 1/4 in. (133.5 mm). 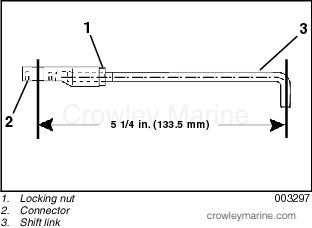 Tighten locking nut. Insert shift link, throttle cable, battery cables, emergency/stop switch wiring harness, and starter switch wiring harness through the cable grommet and temporarily install grommet on front panel rib. Refer to diagram. 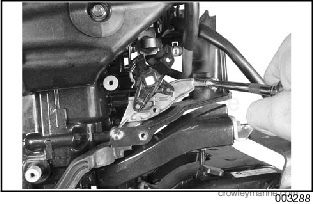 Engage the shift link with the front shift lever and secure with washer and cotter pin. 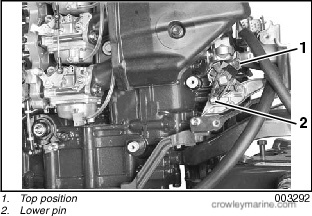 Bend cotter pin as shown. Position shift link connector on notch plate pin and secure with washer and clip pin. 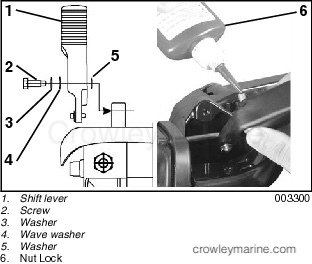 Install the shift lever on the tiller handle bracket using the screw, washer, wave washer, and backing washer. Refer to diagram. Apply Nut Lock to the screw threads. Torque shift lever retaining screw to 90 in. lbs (10 Nm). Install the throttle cable bracket and torque screws to 90 in. lbs. (10 Nm). 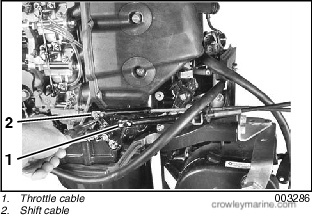 With the throttle cable ends inserted into the throttle drum, secure the cable in the cable bracket. Remove all slack from the cable by adjusting the position of lock nuts. Tighten locking nuts securely. Turn throttle handle to FULL THROTTLE. 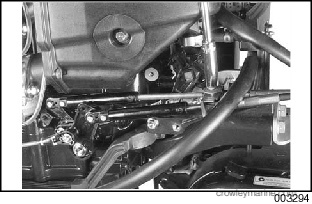 Check that linkage and throttle valves are in full open position. 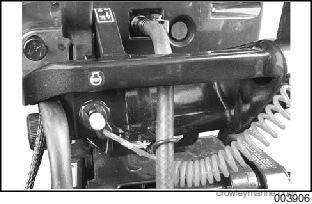 Return throttle handle to IDLE. 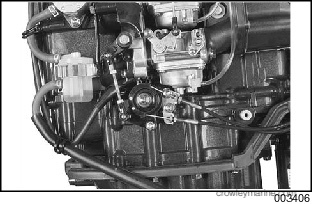 Check that linkage and throttle valves are in closed position. 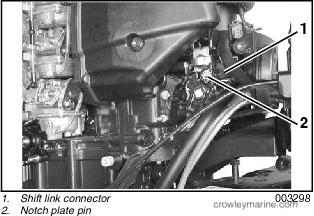 Install the locking nuts and connectors on the throttle limiter rod. 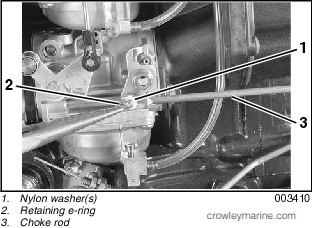 With thread engagement of both connectors equal, make sure rod is adjusted to 9.5 in. (240.5 mm). Tighten locking nuts. Position throttle limit rod on limiter lever pin and throttle drum pin. Secure with washers and clip pins. 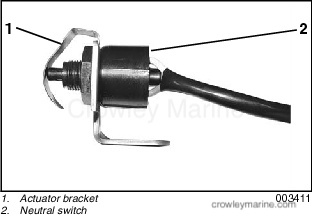 Insert choke rod through cable grommet. Install locking nut and choke knob on choke rod. Thread knob onto rod completely and tighten locking nut. 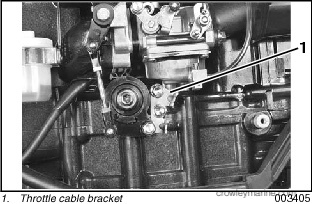 Position nylon washer then choke rod on choke shaft pin of the #3 carburetor. Next install second nylon washer and retaining e-ring as shown. Connect wiring harness adaptor cable to engine harness. Connect stop switch and start switch wiring connectors to adaptor harness connectors. 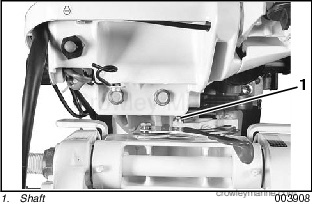 Connect tilt and trim harness connectors and route harness through connector bracket and through lower motor cover grommet with battery cables. Secure wiring and connectors in connector holder. Make sure wire routing does not interfere with moving components. Make sure cable grommet is positioned properly on front panel. Install the lower motor cover(s). Secure battery cables to handle bracket using the clamp. With shift handle in NEUTRAL position, align shift lever decal to indicate shift position. Align the “N” of decal with center rib of shift handle and apply on tiller bracket as shown. 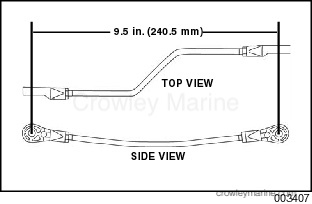 Route fuel supply hose through the fuel hose holder of steering bracket. Steering friction control must operate properly. 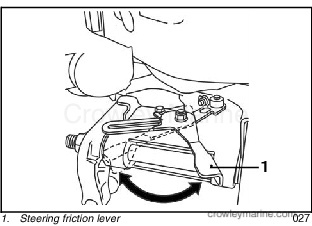 Improper operation, too much friction or no friction, could result in a loss of steering control. 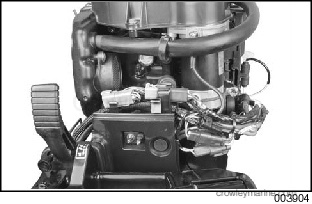 Refer to BEFORE START-UP in the Johnson Operator’s Guide for pre-launch checks before using your outboard. 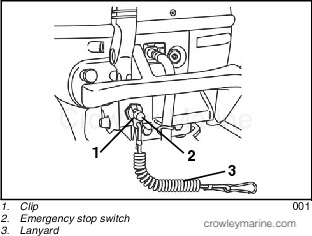 You MUST supply water to the engine before attempting to start it. Engine damage can occur quickly. 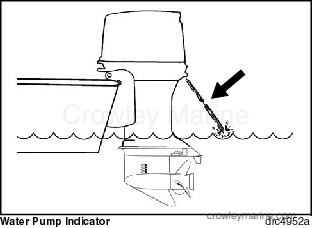 Be sure the water intake screens are below the water surface. 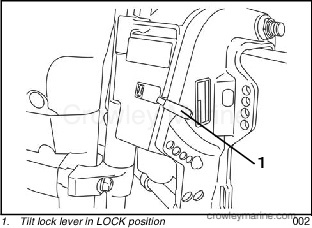 Move the tilt lock lever to the LOCK position. Pull the choke knob fully out. 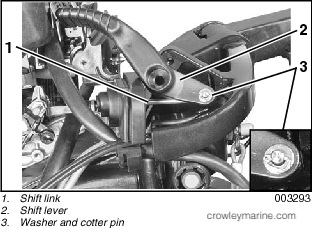 Align the arrow mark on the throttle grip with the START position. Align the arrow mark on the throttle grip with the START position. Do not use the choke. 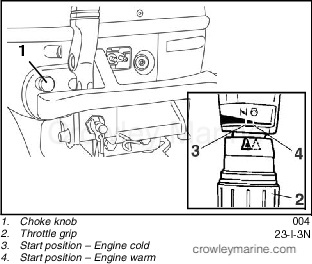 IMPORTANT: You may need to use the choke when restarting a warm engine. If your engine does not start quickly when warm, follow the procedure for cold starting. While seated, press start button to START motor. Crank the engine no longer than 10 seconds. 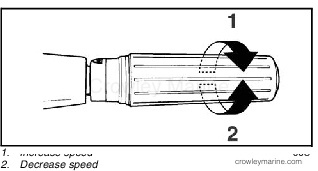 IMPORTANT: The starter motor can be damaged if operated continuously for more than 10 seconds. Release start button as soon as engine starts. If engine does not start, release button momentarily and then try again. DO NOT press start button when the engine is running. Starter and flywheel will be damaged. 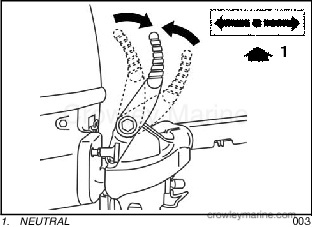 If your outboard does not react normally to this starting procedure or it fails to start, refer to Trouble Check Chart in the Operator’s Guide. Check the water pump indicator. A steady stream of water indicates the water pump is working. If a steady stream of water from the water pump indicator is not visible, stop the engine. 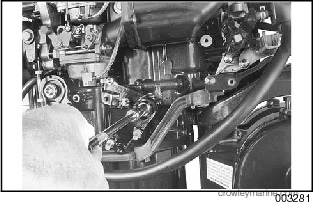 Refer to Engine Overheating in the Operator’s Guide. Twist the throttle grip to SHIFT position or slower. Press the STOP button until the outboard stops running. If equipped, close the vent screw on the fuel tank’s filler cap. With engine running, twist the throttle grip to SHIFT or slower. IMPORTANT: Before shifting into NEUTRAL while boating, twist the throttle grip to SHIFT position or slower, then wait until the engine slows to idle and the boat slows. 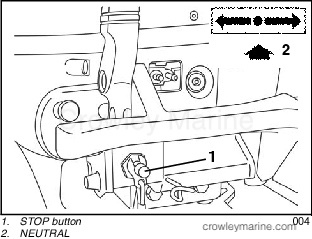 Position NEUTRAL by moving the shift lever to the center position. 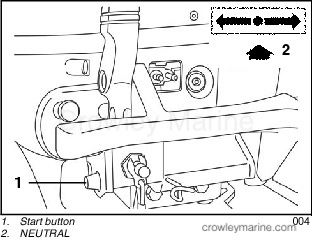 Do not operate the outboard in REVERSE with the tilt/run lever in TILT. 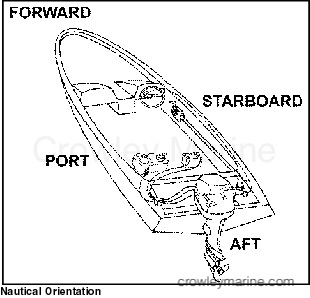 The outboard may tilt out of the water, resulting in loss of control. 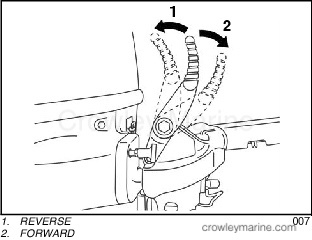 IMPORTANT: Do not apply any grease or lubricant to the pivot point of the steering friction lever. 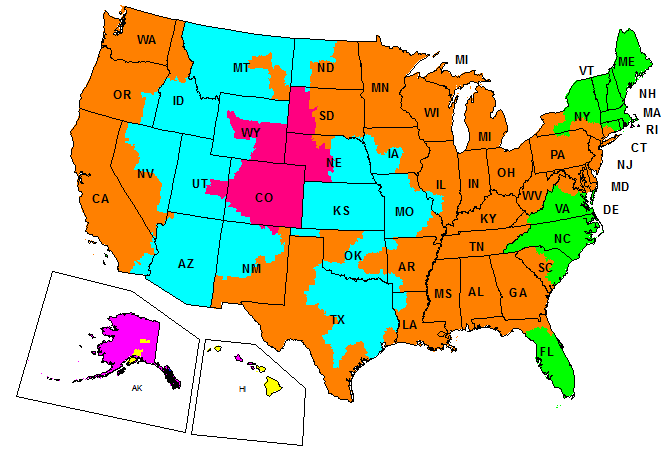 DO NOT overtighten for “hands-off” steering. Reduced steering control could result.